How do I know I have a leak in my swimming pool? If you are adding water more than once a month, you probably have a leak. What does it cost to have our pool evaluated? All service calls charges are based on geographical location and the volume of the pool. Please call for more information. Does anyone need to be home when service is requested? No. Since all of our inspections and pool repairs are done in or around the swimming pool, there is usually no need for the homeowner to be present. Unfriendly dogs and security gates are the only exception. Based on information provided by our customers and our extensive field experience we determine where the leak might be and then begin a systematic search. Do I have to drain the pool in order to have it repaired? No, all of our technicians are certified scuba divers. 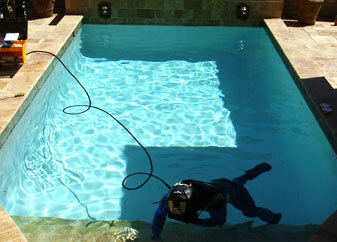 Most of our pool repairs are below the water line and therefore the pool does not need to be drained. Do you only service in-ground vinyl swimming pools? No, we service all types of pools from small ponds to larger commercial pools. Does Coastal Leak Detection, LLC offer any warranties? Yes, all of our repair work is covered under warranty for 30 days. Coastal Leak Detection, LLC accepts all major credit cards, debit cards, checks, and cash. Our transactions our processed via a secured network with a national bank. Coastal Leak Detection, LLC is licensed and insured.